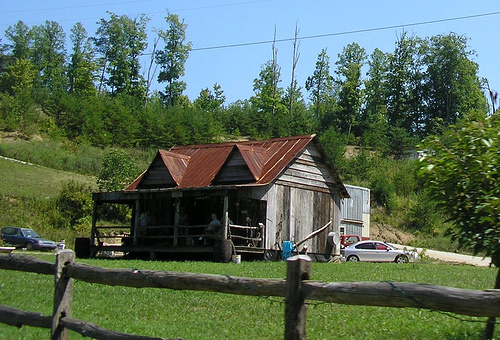 This scene in High Falls, Kentucky would be analyzed differently in different stages of geographic history. Environmental determinist Ellen Churchill Semple famously attributed rural Kentucky culture to the effect of the isolation brought about by its physical environment. Advocates of the quantitative revolution might have examined how High Falls' location was the result of a balance of market forces. Geographers influenced by social theory today may be most interested in how this area would be unjustly affected by mountaintop removal coal mining. Figure 1: The Ancient View of the World. 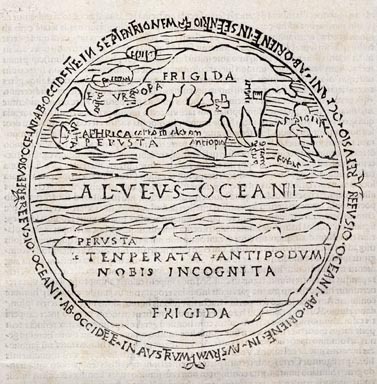 This map, from a Medieval edition of Roman writer Macrobius Ambrosius Theodosius's Commentary on the Dream of Scipio, reflects the accumulation of Greek, Hellenistic, and Roman data and theories about the world. This textbook is written from within the cultural and intellectual tradition commonly called "Western" -- associated with the cultures originating from western Europe, North America, and Down Under. Nevertheless, this Western tradition has been greatly influenced by ideas coming from other regions of the world. As Western geography is the politically and culturally dominant way of understanding our world today, it is important to have some idea of how this intellectual tradition came to its present form. Western geography typically traces its roots to the classical period of ancient Greece and the "Hellenistic" world that they established around the eastern Mediterranean. Building on ideas from the Middle East and Egypt, Greek writers give us some of our first recorded geographical theories, such as recognition of environmental degradation from human overuse, and the idea that climate shapes the culture and achievements of a society (Glacken 1976). Hellenistic thinkers developed many of our important map projections, and calculated the circumference of the Earth with remarkable precision. Nevertheless, the Greeks were also prone to accepting fantastical tales about far-away regions (such as headless people with faces in their chests supposedly inhabiting distant regions of Africa). And some of their theories were based on mathematical symmetry rather than empirical information -- such as the theory that an impassable torrid zone encircled the equator, beyond which lay a land mass (the "antipodes") of size equal to the land in the northern hemisphere (Figure 1). During the Middle Ages, Greek knowledge and ideas were taken up and elaborated upon by Muslim geographers. Expanding Arab and Persian trade routes brought together increasing amounts of new knowledge about the world and created a need to synthesize it. During this period, Tunisian geographer Ibn Khaldun's analysis of the rise and fall of empires laid the foundations for modern world systems theory. In Christian Europe, geography at this time took on a sacred focus. Popular maps included linear pilgrimmage maps, marking the stops along the way to a particular sacred destination. "T and O" world maps, which showed the world as a round disc divided into three continents by the Mediterranean, Nile River, and the Don River, were more conceptual devices than attempts at accurate cartography. Figure 2: John Smith's Map of Virginia. 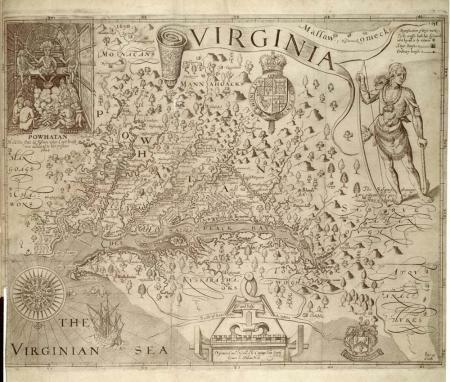 This map, from John Smith's The Generall Historie of Virginia, uses information from Native American sources to make this new colony understandable and governable by Britain, whose claim is staked by the large coat of arms. A new chapter in the development of geography opened up with the age of European exploration and colonialism. Exploration far beyond Europe's borders brought back a wealth of information, expanding European horizons about the diversity of human cultures and environmental conditions. But this new information was not merely a matter of curiosity. Expanding European colonial empires and trading systems required detailed data about these new possessions as well as territories close to home. Cartographers sought to systematize their renderings of newly explored regions, announcing colonial control through colorful maps (Figure 2). Effective, detailed land surveys enabled increasingly powerful governments to exercise control over their territories and possessions (Scott 1998). Meanwhile, geographers were hired to teach children about their homeland's empires, reinforcing the ideology of colonialism (Capel 1981). 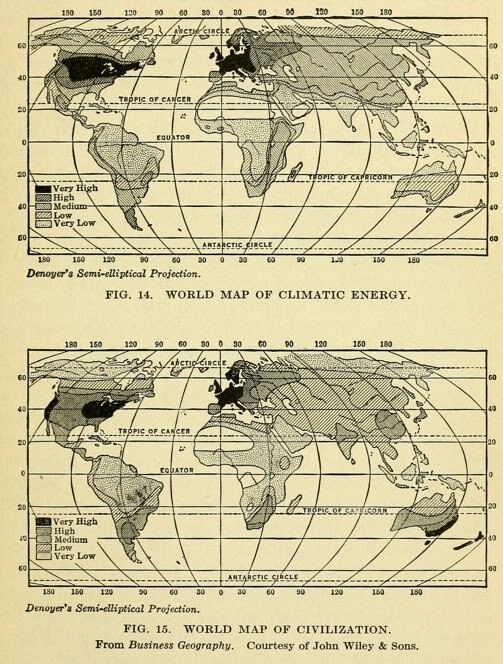 The establishment of geography as an academic discipline at the end of the 19th century and beginning of the 20th century coincided with the rise of environmental determinism. Though environmental determinist ideas -- which held that features of human society are caused by features of the natural environment (Semple 1911) -- had been in circulation since the ancient Greeks, the new discipline of geography dedicated itself to developing and elaborating the determinist hypothesis. This drive was influenced by the rise of the theory of evolution in biology, which was seen as the paradigm of a successful science (Campbell and Livingstone 1983). Geographers sought a similarly powerful, unifying idea for their discipline. Non-socialist environmental determinists commonly cited biology or race as the link between the environment and culture. Climatological or topographical conditions pushed people to evolve certain inherent characteristics, which they then took with them when migrating away from their ancestral homelands (Huntington 1915) (Figure 3). Socialist environmental determinists argued that environmental conditions enabled or inhibited the development of certain modes of economic production, which in turn determined the remainder of human culture (Bassin 1992). Figure 3: Ellsworth Huntington's Environmental Determinism. Environmental determinists like Huntington proposed a correlation between climate conditions and levels of civilization. In the 1920s and 1930s, environmental determinism came into disrepute. It was increasingly clear that the data simply did not support strictly environmental determinist conclusions. Moreover, resistance was building against biological notions of race that played a key intermediary role in environmental determinist explanations. Environmental determinism came to be seen as an intellectually bankrupt attempt to put a sophisticated veneer on racism and colonialism. Because geography had staked its identity as a discipline on the correctness of environmental determinism, discrediting the theory led to calls to abolish the discipline. Most elite colleges in the United States disbanded their geography departments -- for example, among the eight Ivy League universities, only Dartmouth still offers geography (Smith 1987). Geography survived at many large public universities because it was necessary for training elementary and high school social studies teachers. Embarassed by the excesses and failures of environmental determinism, geographers retreated to a focus on exploring the nature of particular places. Chorology, as this approach was called, sought to build a picture of a specific place or region, examining how the geological, climatic, economic, cultural, and political features of the place interacted (Hartshorne 1939). In its worst form, chorology produced comprehensive descriptions of localities that were of little interest to anyone not connected to that place. One group of researchers that flourished during this era, the "Berkeley school," developed the concept of the cultural landscape and taught its students how to read the accumulated layers of history marked on the land by the interactions of nature with successive waves of human inhabitants (Sauer 1925). The launch of the Soviet Union's Sputnik satellite in 1957 created a burst of attention to science in the non-communist West. In geography, this shift toward a scientific approach is called the quantitative revolution, and its proponents are often teasingly called "space cadets" because of their interest in the quantitative analysis of geographical space. The quantitative revolution insisted that geographers should follow the model of the natural sciences in forming hypotheses directed at clear research questions, then collecting mathematical data with which to test them (Harvey 1969). In human geography, space cadets looked at such phenomena as the spatial arrangement of settlements and market areas, the form of the urban hierarchy, and the rate of diffusion of new cultural traits. In human-environment geography, the spirit of the quantitative revolution was carried on by the "Chicago school" of natural hazards research (Burton, Kates, and White 1978), and by cultural ecology (Butzer 1989). There were clear differences between these two schools of thought -- the Chicago school took a pragmatic approach to policy analysis largely in the developed world, while cultural ecology sought knowledge in mostly rural developing world contexts. Nevertheless, both of these groups drew on two main intellectual frameworks: systems theory and behavioralism. Systems theory emphasized the flow of energy and materials through ecosystems, looking for feedbacks that either created or undermined the equilibrium of the system. Cultural ecologists working with systems theory were noted for calling attention to the way that "primitive" ways of life were actually quite sustainable. Behavioralism was interested in the decision-making process of the conscious actor. Behavioralists went beyond the model of the perfectly rational actor in neoclassical economic theory, showing how various biases, cognitive shortcuts, and satisficing (settling for "good enough") shaped human behavior. The most lasting impact of the quantitative revolution was its role in laying the groundwork for Geographic Information Systems (GIS). GIS consists of computer applications to process and analyze spatial data (Sutton, Dassau, and Sutton 2009). The analytic techniques developed by the space cadets were developed into computer programs from the 1980s onward, allowing for the easy handling of large amounts of data (such as that collected by remote sensing satellites sent up after Sputnik). 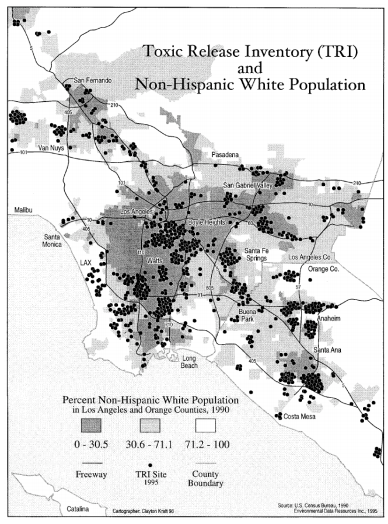 Figure 4: Laura Pulido's Map of Environmental Racism. This map shows that toxic releases in Los Angeles are concentrated in neighborhoods predominantly inhabited by people of color. Pragmatism, which reminds us to focus on how knowledge is useful rather than whether it's the one and only truth (e.g. Barnes 2008). At the same time that social theory was making its mark, there was also an upsurge in interest in the effective management of human relationships with the environment, and a concern about the sustainability of our civilization. Universities that had eliminated geography programs out of embarassment at the excesses of environmental determinism now rushed to create programs in "environmental science" and "environmental studies." Geographers played an important role in developing this new discipline that overlapped on geography's traditional territory. In environmental studies, ideas from the natural sciences could be blended with social theory, often with substantial use of GIS (Turner et al. 2001). It is difficult to predict the future, so we cannot say with certainty what will become of the discipline of Western geography in the coming decades. However, the chapters of this textbook should demonstrate that the ideas developed by geographers are essential for the future of our society and our world. Barnes, Trevor J. 2008. American pragmatism: towards a geographical introduction. Geoforum 39: 1542-1554. Bassin, Mark. 1992. Geographical determinism in fin-de-siècle Marxism: Georgii Plekhanov and the environmental basis of Russian history. Annals of the Association of American Geographers 82 (1): 3-22. Butzer, Karl W. 1989. Cultural ecology. In Geography in America, ed. G.L. Gaile and C.J. Willmott, 192-208. Columbus, OH: Merrill Publishing Company. Campbell, J.A., and D.N. Livingstone. 1983. Neo-Lamarckism and the development of geography in the United States and Great Britain. Transactions of the Institute of British Geographers 8: 267-294. Capel, Horacio. 1981. Institutionalization of geography and strategies of change. In Geography, Ideology, and Social Concern, ed. D. R. Stoddart. Totowa, NJ: Barnes and Noble. Dear, Michael. 1988. The postmodern challenge: reconstructing human geography. Transactions of the Institute of British Geographers 13: 262-274. Escobar, Arturo. 1996. Constructing nature: elements for a poststructural political ecology. In Liberation Ecologies: Environment, Development, Social Movements, ed. R. Peet and M. Watts, 46-68. London: Routledge. Glacken, Clarence J. 1976. Traces on the Rhodian Shore: Nature and Culture in Western Thought From Ancient Times to the End of the Eighteenth Century. University of California Press. Hartshorne, Richard. 1939. The Nature of Geography: A Critical Survey of Current Thought in Light of the Past. Lancaster, PA: Association of American Geographers. Harvey, David W. 1969. Explanation in Geography. Edward Arnold. Harvey, David. 1996. Justice, Nature and the Geography of Difference. Cambridge, MA: Blackwell. Huntington, Ellsworth. 1915. Civilization and Climate. New Haven CT: Yale University Press. Huntington, Ellsworth and Frank E. Williams 1922. Business Geography. London: John Wiley and Sons. Peet, Richard. 1998. Modern Geographical Thought. Malden, MA: Blackwell. Sauer, Carl O. 1925. The morphology of landscape. University of California Publications in Geography 2 (2): 19-53. Semple, Ellen Churchill. 1911. Influences of Geographic Environment: On the Basis of Ratzel's System of Anthropo-Geography. Smith, Neil. 1987. "Academic war over the field of geography": the elimination of geography at Harvard, 1947-1951. Annals of the Association of American Geographers 77 (2): 155-172. Sutton, T., O. Dassau, and M. Sutton. 2009. A gentle introduction to GIS. Spatial Planning and Information, Department of Land Affairs, Eastern Cape. Tuan, Yi-Fu. 1974. Topophilia: A Study of Environmental Perception, Attitudes, and Values. New York: Columbia University Press. Turner, B. L., Sergio Cortina Villar, David Foster, Jacqueline Geoghegan, Eric Keyes, Peter Klepeis, Deborah Lawrence, et al. 2001. Deforestation in the Southern Yucatán Peninsular Region: an integrative approach. Forest Ecology and Management 154: 343-370. Whatmore, Sarah. 2002. Hybrid Geographies: Natures, Cultures, Spaces. Thousand Oaks, CA: Sage.